How would you like to boost your productivity in Excel? Look at the time you spend in Excel doing relatively simple repetitive tasks and you’ll understand that using Excel effectively will boost your productivity. 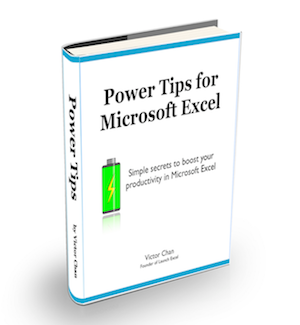 Power Tips for Microsoft Excel is an eBook and set of videos that helps you learn simple secrets of doing repetitive tasks faster in Excel. It’s based on more than 10 years of personal experience with Excel. Time-saving Skills – What fundamental skills do you need to know to save time when working in Microsoft Excel?